Made in Mongolia NYC store offering a wide selection of Mongolian products imported from Mongolia. 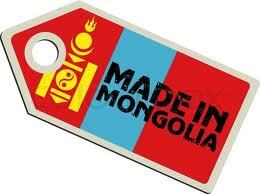 … We are based in New York and we offer the best selection of Mongolian art, souvenirs, hand made product. It is better to reserve via our website BEFORE 11/16th! When reviewing your donation, make sure to click on “Number of adults and children in party” to let us know how many people are in your group! LIMITED SEATS SO RESERVE YOURS NOW! CENTRAL PARK — In a scene that could have been straight from the grasslands of Mongolia, two pairs of wrestlers, each bare-chested except for a tight-sleeved vest around his shoulders, engaged in face-to-face battle — hands locked, arms outstretched, in a bid to take down his opponent. But that scene on Saturday afternoon was instead taking place in a small meadow near Central Park’s Bethesda Fountain. Nearby, on a long table filled with Mongolian fare, a few men poured vodka from a tall, gold bottle decorated with an image of Genghis Khan, the founder of the Mongol Empire. The wrestling competition was the highlight of the New York Mongolian community’s Naadam celebration, an annual festival commemorating Mongolia’s independence as well as the nation’s nomadic heritage. About 75 people, including Od Och, the permanent representative of Mongolia to the United Nations, attended Saturday’s event, which was organized by the Mongolian Heritage Foundation of Flushing, Queens. Byambakhuu Darinchuluun, president of the Mongol Heritage Foundation, said the goal of the event was to bring unity to the various Mongol peoples of the greater New York area and to promote Mongolian culture to the general population. Naadam, also known as the “Three Games of Men” or the Nomad Olympics — the other sports being archery and horse racing — has its roots in centuries-old Mongol warrior competitions. In 2010, the festival was added to UNESCO’s Representative List of the Intangible Cultural Heritage of Humanity. Landlocked between China and Russia, Mongolia has one of the lowest population densities of any nation on earth. But there are several hundred Mongolians living in the New York City area, according to Morris Rossabi, a professor of Mongolian History at Columbia University. The greater New York area is also home to a sizable Kalmyk population, people of Mongol descent who are from Kalmykia, a Russian Republic on the Caspian Sea, he said. Several of Saturday’s attendees dressed in traditional Mongolian costumes, and the top outfits were rewarded with prizes. 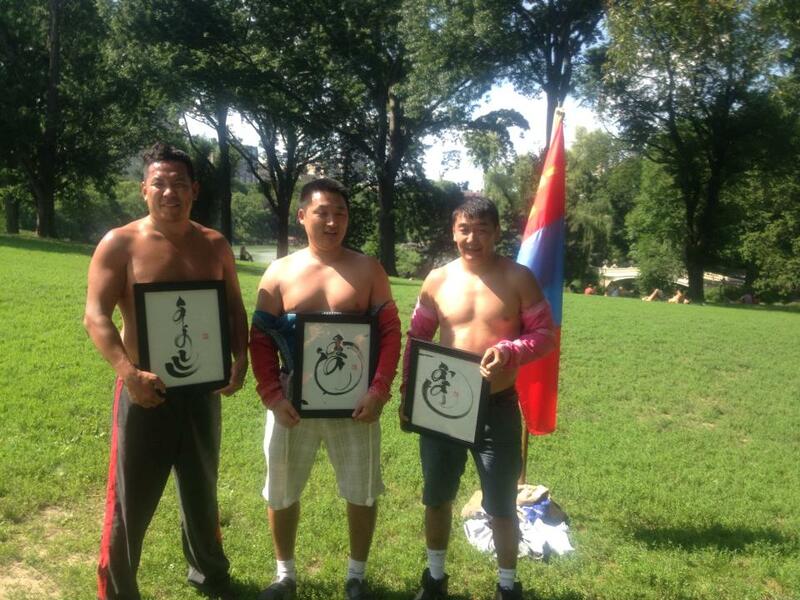 The best wrestlers were given framed pictures of Mongolian calligraphy and were handed wads of cash. Attached to a nearby rocky hill was the flag of Kalmykia, and at its base, a horse-headed fiddle — a long, double-stringed musical instrument that is a national symbol of Mongolia, rested against a picnic table. The Mongolian flag was staked almost precisely in the center of the meadow, and waved in the hot air. Tsenguun Chinbat, 27, a teacher who is from Ulan Bator, the capital of Mongolia, said she attended the festivities to connect and socialize with fellow Mongolians. “I wanted to get a feel for home,” she said. If you can’t make it to Ulan Bator for Mongolia’s National Celebration Naadam the Mongol Naadam Festival in Washington DC is your next-best option. The event held annually in the Mongolian capital Ulan-baatar celebrates that country’s three main sporting pastimes: Mongolian wrestling, archery and cross-country horse racing. Although the Washington DC Naadam is scaled back somewhat (there’s no archery competition, and a child’s footrace replaces the horse race), the wrestling competition is the main attraction;. The Mongol Naadam is not as bilingual as other festival in the area, so brush up on your conversational Mongolian and bring your appetite for khuushuur, deep-friend pockets of dough stuffed with minced mutton or beef, garlic and onions. On behalf of President Obama and the American people, I would like to convey the very best wishes to the people of Mongolia as you celebrate your National Day on July 11. There is certainly cause for celebration, as the people of Mongolia recently participated in yet another free and fair presidential election, evidence of Mongolia’s strong commitment to its democratic process. Through ongoing cooperation, the U.S. looks forward to further strengthening our bilateral relationship and promoting economic growth that will benefit both our countries. I would like to express our gratitude to Mongolia for your invaluable contribution to coalition and international peacekeeping activities. Mongolia is playing an active and important role in promoting peace and stability around the world, and the United States stands with you as partner and friend. Mongol Heritage Foundation & NYC Mongols, Kalmyk Project in the NYC is holding First annual Naadam celebration in near Bethesda Fountain ,Central Park , New York. The celebration will be opened by H.E. Ambassador Od Och, Permanent Representative of Mongolia to the United Nations. The NYC Mongols celebration “Naadam” 2013 will take place on Saturday July 6th from 11:00am – 7:00 pm at the west side of the “Bethesda Fountain” Central Park where the Mongol tradition of “Naadam” will happen among the all Mongol people who live in the greater New York area. This Festivity is the one of the major celebration on the Mongols honor of the national holiday of Motherland Mongolia. 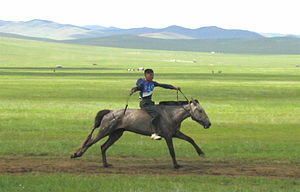 During the celebration, Mongolians compete in traditional sporting events and competitions that include , wrestling, and children’s wood horse racing. We encourage you to invite your friends and family to this exciting and interesting event where the New York Area Mongols will join together in a traditional celebration. All of the Mongols including Buryats, Kalmyks, Hazaras ,Tuvans and Inner Mongolians are join in the celebration. Everyone who is interested in Mongolia and Mongol Culture is invited; people who are interested in Mongolia and the Mongolian Culture such as Americans who have lived and worked in Mongolia through the Peace Corps will attend. Where: The Bethesda Fountain, Central Park is one of the largest fountains in New York, measuring twenty-six feet high by ninety-six feet wide.It is one of the most well known fountains in the world.This neoclassical sculpture, also known as Angel of the Waters, features an eight-foot bronze angel who stands above four small cherubim representing health, purity, temperance, and peace. Get involved :You’ll meet new Mongol people, have fun and support a great event. Please bring food to share and your beverages to drink. There will be Mongolian food and games to play. Boortsog, suutei tsai, byaslag and plates, napkins, silverware, etc. will be provided by the Mongol Heritage Foundation . some ideas on what to expect and what you should do when you attend during Naadam Event. Although the NYC Naadam is scaled back somewhat (there’s no archery competition, and a child’s footrace replaces the horse race), the wrestling competition is the main attraction. 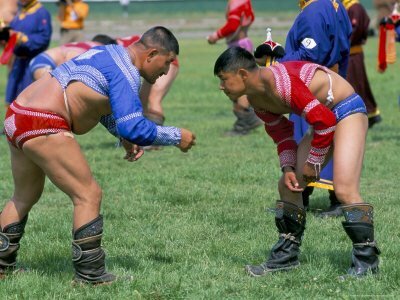 Mongolian traditional wrestling is an untimed competition in which wrestlers lose if they touch the ground with any part of their body other than their feet or hand. When picking pairs, the wrestler with the greatest fame has the privilege to choose his own opponent. Wrestlers wear two-piece costumes consisting of a tight shoulder vest (zodog) and shorts (shuudag). Only men are allowed to participate.Each wrestler has an “encourager” called a zasuul. The zasuul sings a song of praise for the winning wrestler after rounds 3, 5, and 7. Winners of the 7th or 8th stage earn the title of zaan, “elephant”. The winner of the 9th or 10th stage, is called arslan, “lion”. In the final competition, all the “zasuuls” drop in the wake of each wrestler as they take steps toward each other. Two time arslans are called the titans / giants, or avraga. 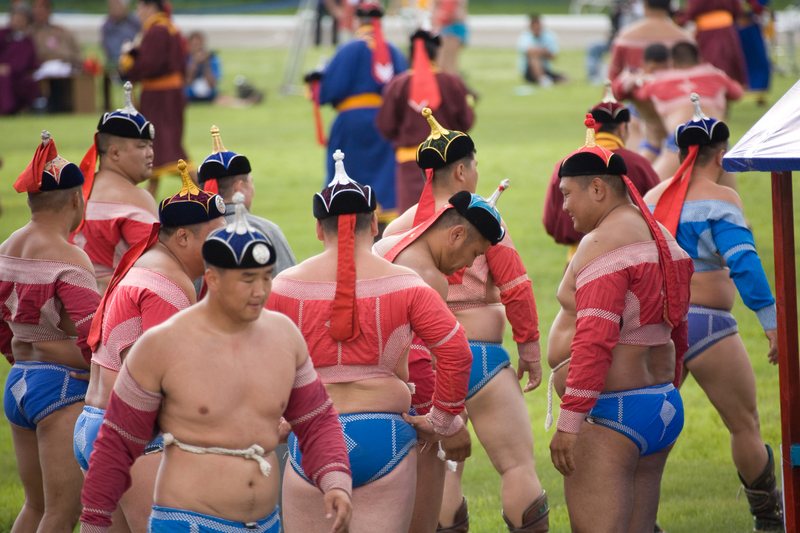 Shagai games are especially popular during the Mongolian summer holiday of Naadam. In shagai dice, the rolled shagai generally land on one of four sides: horse, camel, sheep or goat. Mongolians still exchange shagai today as tokens of friendship. The shagai may be kept in a little pouch.A large variety of traditional Mongolian games are played using the shagai pieces. Depending on the game, the anklebones may be tossed like dice, flicked like marbles, shot at with arrows, caught in the hands, or simply collected according to the roll of a die. In many games, the side on which a tossed piece lands (horse, sheep, camel, or goat) is significant. Typically it is blue to represent the beautiful blue sky. Please bring your Khadag greet with Mongols. The Classic Mongolian script written from the top downwards and in clockwise turns and has a classic vertical direction which expresses the almost optimal movement of handwriting due to the theory of probability. Yohor is a circle dance. Buryat Mongol peoples have some form of circle dance. Yohor is the Buryat version. The chief characteristics in this belief is the concept of the world axis, represented by a tree, by the serge, or by the oboo. As part of these customs there is the use of the circle dance for shamanist ritual and worship at these places which is called the yohor. The dance may encircle the sacred tree or object, or the shaman who is conducting a ritual. These circle dances may last for hours, and are punctuated by the phrases yohor-o or heeyo. The yohor is extremely ancient and is depicted on rock carvings thousands of years old. NYC Mongol Library is designed to provide the opportunity to explore the richness of Mongol history. The Mongol Heritage Foundations Library provides many interesting and informative books in Mongolian, and English pertaining to Mongol history, art, geography, literature, and culture. In addition, recreational reading includes periodicals, newspapers, biographies, magazines, novels, and materials about travel. Cheese from milk of cattle, yaks, goats, or sheep. Most commonly, the milk of yak and cattle is used. Goats and sheep are not milked in all places, but make for the most aromatic cheese. However, mongolian cheese doesn’t get to ripen like its european counterparts, so the overall taste is somewhat bland in comparison. “Worm Aaruul” is a variation in the shape of little strands, often sweetened. Don’t press the fresh material, but put it through a meat grinder (available in every mongolian houshold) into small “worms”. Arrange those in little heaps for drying. This type of Aaruul is easier to chew (especially for children), but less suited for travel supplies. Suutei Tsai- The most favored drink during this holiday is Mongol milk tea .Milk tea is an indispensable part of the Mongolian’s daily life. One of the Mongolian most famous delicious meals is of course the Khuushuur. It’s a meal that consist of meat, onions and other ingredients put together and wrapped with flour dough, and afterwards it’s fried in oil. Everyone loves the taste of khuushuur in Mongolia..Mongolians hold the fresh khuushuur between their palms and also with the tips of all fingers to stimulate the nerves and blood circulation in the hands. This is believed to be curative. In some occasions, a hot khuushuur is placed on the soles of the feet and other selected places to treat neurosis and health conditions related to the balance of the air element of the five elements composing the human body. 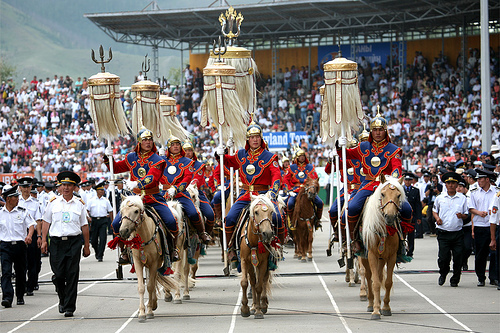 Naadam celebration 2013. The music has a largely Mongol theme. Event organizers have put considerable thought into selecting the music, and their choices blend traditional music with some newly commissioned pieces. Leading a discussion about the stories and images in Chiara’s work. Opening Night: Tuesday, April 9, 7:30 p.m.
On April 9, photographer Chiara Goia will open an exhibit at The Half King of her images from the fastest growing economy in the world—Mongolia. Chiara’s work looks at the cultural impact of Mongolia’s sudden economic growing pains and boons. The Half King Photography Series is dedicated to showing exceptional documentary photography. In tandem with its reading series, it fosters a dialog between photographers and writers that underscores the importance of their relationship. Co-curating its photography series are James Price, photo editor at Newsweek, and Anna Van Lenten, writer and editor. Chiara Goia was born and raised in Italy. Her clients include The New Yorker, The New York Times Magazine, National Geographic, Time, Le Figaro, and Vanity Fair. Among her recognitions are the Sony World Photography Award, the Canon prize for emerging photographers, and PDN‘s 30. 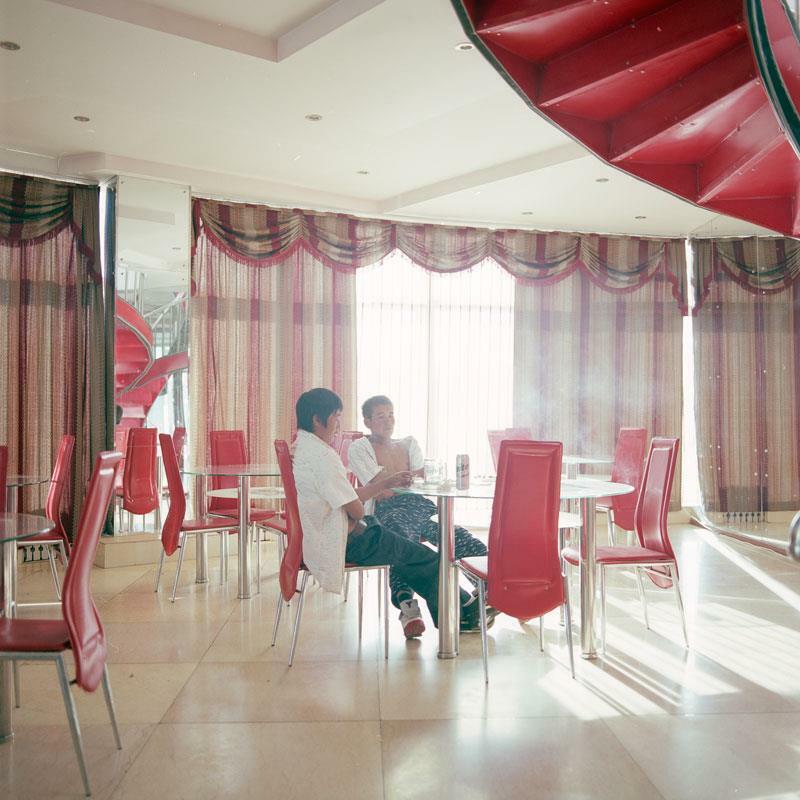 Documenting Mongolia’s dizzying transformations is an ongoing project. Ph.D. in Bio statistics Sanj Altan received one of the highest hon-ours bestowed upon a foreigner by the Mongolian Government: the Friendship (Nairamdal) Medal. Washington DC, USA: Germany-born Ph.D. in Bio statistics Sanj Altan received one of the highest hon-ours bestowed upon a foreigner by the Mongolian Government: the Friendship (Nairamdal) Medal. Presented by Zandaakhuu Enkhbold Chairman of the State Great Hural (Chairman of the Mongolian Parliament )in a U.S. Capitol ceremony,March 20, 2013, the medal is a reflection of the affection and appreciation felt by Mongolians for his work. Sanj Altan was born in 1947 in Pfaffenhofen, Germany. His family emigrated to the US in 1951. His grandparents had fled Russia following the 1918 revolution and were part of the Kalmyk emigre community in Eastern Europe during the 20s, 30s and 40s. He graduated from Rutgers University in 1968 and from Temple University in 1977, with a PhD. in Bio statistics. He is currently employed by Johnson & Johnson where he supports pharmaceutical drug development. Sanj Altan traces his interest in Mongol culture to his parents, who insisted on speaking their Mongolian dialect at home, and his teachers, the late Professor Gombojab Hangin, who inspired his pursuit of the Pan-Mongol movement, and the late Tsorj Lama, former Abbott of the Khorgha Temple in Western Sunid, Inner Mongolia, who inspired his spiritual pursuit of the annual commemoration of Chinggis Khan. Mongolic identities, even if that lasts for only one day. Thus, many of our ethnic kins who may use non-Mongolic languages in daily life drove hundreds of miles for the annual gathering simply to “reboot” the aspect of their identity for which they want recognition and preservation.If coming together in honor of Chinggis Khan were all about identity, then we might ignore how much the event is also meant for promoting greater mutual contact,understanding, network, kinship, and even empathetic feelings among different Mongolic groups, among individuals within a group,and among individuals across groups. I positively noticed that attendees, different Mongolic groups as they represent, were not necessarily concentrated according to specific group or regional identities, but presented a tendency to seat themselves randomly, which had the potential of facilitating conversations between individuals who might previously have had little knowledge about one another’s Mongolic heritage. The event was also my first of its kind where members of different Mongolic groups had an opportunity to appreciate one another’s music, songs, and dances all within one sitting. I was no less impressed with the already-established cross-group networks evinced at the reception where members of different Mongolic groups were able to proactively approach one another. A day of building consciousness of one an other’s existence and experience may pave way for further interactions conducive to the development of emotional attachment. Such attachment will be indispensable in order to genuinely bind various Mongolic groups together by transcending the linguistic, religious,cultural, historical,and political barriers that give them myriad justifications not to build solidarity with one another. Solidarity building does not need to come at the expense of the amazingly diverse historical, cultural, religious, and linguistic heritages various Mongolic peoples claim. If MACA designates this annual ceremonial event for allowing people of Mongolic roots to assert a common identity as well as for generating greater cohesion among them, then it can equally be understood as a stage on which for Mongolic peoples to share with one another the unique and distinct aspect of their identity. The dancers and singers from Mongolia-the-independent-state represented the most-blossoming and best-supported of Mongolic cultural traditions by showcasing the biyelgee dance as well as the inebriatingly beautiful operatic singing’s developed out of folk songs (ardiin duu). In the meantime, the band from the Ordos subregion of Southern Mongolia signaled to attendees a persistent and unrelenting pride Southern Mongolians take in their Mongolic identity by graciously blending both ethnic andpopular elements into their rendition and by offering a medley of Southern Mongolian folk songs that people like me have been so much missing. Buryat artist Namgar Lkhasaranova and the other two ethnomusicians demonstrated the highly distinct musical heritage of the Buryat people in Southern Siberia that I had not been able to contemplate until at the event. As the first Mongolic community settled in the U.S. and the most significant proponents of MACA, Kalmyks dedicated their fusion of Oiratic and North Caucasus traditions, which again invited various Mongolic peoples to marvel at our diversity. Though subjected to mass deportation in the mid-1940s, Kalmyks not only maintained their ethnic morale, but also initiated the presence of Mongolic peoples in the U.S. The representation of the Iranic-speaking Hazara people at the ceremony can also be marked as an example of re-oriented ethnonational consciousness and of the tremendous cultural and historical diversity among Mongolic peoples we have yet to explore. Hereby, another génie of MACA’s annual Chinggis Khan Memorial Ceremony is its serving as probably the only occasion, tomy knowledge, to be able to integrate a widest possible range of Mongolic diversity into one theme. Thanks to pioneers of our senior generations from Southern Mongolia (Övör Mongol),Kalmykia (Xalimag), and Mongolia-the-independent-state (Ar Mongol) who sowed the seeds for a Pan-Mongolic communal tradition in the U.S., this annual gathering has been hopefully achieving a threefold mission: commemorating a common founding hero, Chinggis Khan, who laid the foundation for the distinct identities Mongolic peoples hail today, congregating people of various Mongolic heritages to facilitate their mutual understandings as well as to revive ethnic kinship that has been historically undermined, as well as consolidating support from the greater U.S. society with regard to issues concerning the Mongolic world. In retrospect, this year we have had music and dance heritages of Mongolia-the-independent-state, Southern Mongolia, Kalmykia, Buryatia represented. In prospect, perhaps next year there would be those of Tuva and Hazaristan added? The North America-Mongolia Business Council, Inc.
Open-to-the-Public Events during Enkhbold/Bat-Uul delegation visit to the US and Canada – From March 17 to March 29, Parliament Chairman Z. Enkhbold and Ulaanbaatar Governor/Mayor E. Bat-Uul will visit Denver, Washington, DC, New York City, Ottawa, and Vancouver. Governor Bat-Uul will also visit Calgary. The following events are open to the public. Two of the three are free; all require an RSVP. Denver – Monday evening, March 18, 6:00 PM – Reception at the Denver Botanical Gardens, 6:00 PM to 7:30 PM, hosted by the Denver Botanic Gardens, Wagner Equipment, Inc. and the Ulaanbaatar-Denver Sister Cities Committee, in honor of Chairman Enkhbold, Governor Bat-Uul, Mongolian Ambassador to the US Bulgaa Altangerel and the Mongolian Delegation; FREE but RSVP required to Honorary Consul Office in Denver by 12:00 Noon, March 18, (303) 981-8274, legalsupport@wagenlander.com. Denver – Tuesday morning, March 19, 8:00 AM — “Discovering Mongolia: A Conversation with Speaker Enkhbold,” 8:00 AM to 9:15 AM; breakfast and public forum on Mongolia and business in Mongolia with Speaker Enkhbold and other panelists; at the Knoebel School of Hospitality Management at the University of Denver, 2044 East Evans Avenue, Joy Burns Center. This program is sponsored by the World Trade Center Denver, the Daniels College of Business and the NAMBC; famed Mongolian columnist and TV commentator, D. Jargalsaikhan, will be the moderator. Fee: $35 for World Trade Center Members; $45 for Non-Members; advance registration required, www.wtcdenver.org See flyer attached. Both Speaker Enkhbold and Jargalsaikhan earned International MBAs at the University of Denver. April 19 is registration deadline for NAMBC 2013 Annual General Meeting, Washington, DC, May 7-8 ; Non-Members welcome — The registration deadline for the NAMBC’s 23rd Annual General Meeting (AGM) in Washington, DC, May 7-8, 2013 is April 19, after which a US$75 late fee is imposed. A registration form is available below. Non-members are warmly welcome. The AGM starts on the evening of Tuesday, May 7, with an opening reception at the Mongolian Embassy hosted by Ambassador Bulgaa Altangerel, followed on Wednesday, May 8, by a full day of presentations and discussion, including lunch. Speakers will include senior US Government officials, diplomats of Mongolia, the US and Canada, and a panel of experts on Mongolia with a cumulative 80 years hands-on experience of and in the country. Venue for the 2013 AGM is the Residence Inn Arlington Capital View, 2850 South Potomac Avenue, Arlington, VA 22202, 10 minutes from Reagan National Airport and close by a Metro station. April 15 is the deadline for reserving hotel rooms at the NAMBC group rate of US$219 per night for single or double occupancy, which includes breakfast. To make room reservations at the discounted rate, click on the link below to reach the automated reservation system for the hotel; that site already contains the group code (namnama). If you wish to reserve rooms for check-in before May 6 or check-out after May 9 OR if you encounter any difficulty with the online system, please contact our event manager at the hotel, Ms. Latoya Swan, Latoya.Swan@renaissancehotels.com, telephone (571) 814-4048 . Be sure to mention that you are reserving at the NAMBC rate. Mongolian mining student wins logo design competition for 40th anniversary of Mongolia-Canada diplomatic relations — Seventy-four designs were received in the competition among Mongolian students sponsored by the Canadian Embassy in Ulaanbaatar to design the logo commemorating the 40th anniversary of Canada-Mongolia diplomatic relations. The winning design was submitted by B. Bold-Erdene, a second year mining student at the Mongolian University of Science and Technology. Canadian Ambassador Greg Goldhawk presented Bold-Erdene with a new iPhone 5 as a prize, noting that the independent selection panel found it difficult to make a final choice because all the entries reflected different facets of the bilateral relationship. Mongolia opened diplomatic relations with Mongolia on November 30, 1973. The Canadian Embassy in UB opened in 2008. The design is in the public domain and all Canadian companies involved in Mongolia are welcome to use it during this anniversary year. Please note the AGM registration form below. To unsubscribe – If you do not wish to continue to receive this newsletter, please send an email to hqinfo@nambc.org with the word “REMOVE” in the subject line. It can take up to 10 days to effect a removal so please be patient if you have made a recent removal request. North America-Mongolia Business Council, Inc. Registration deadline is April 19, after which a late registration penalty of US$75 per person is assessed. For NAMBC Members Only, 2nd and all other delegates from the same company receive a 20% discount. After filling out this form, send it by email to hqinfo@nambc.org or by fax to 01+ (703) 549-6526. Please fill out a separate form for each delegate if you are registering more than one. September 17 – September 17 is the RSVP deadline for the US Commerce Department’s Sixth US-Mongolia Business Forum on Monday, September 24, 3:00 PM to 5:30 PM, during the MINExpo 2012 trade show in Las Vegas. The Forum will focus on mining and will be held at the Las Vegas Convention Center. There is no charge to attend and you may attend even if you are not registered for MINExpo. All US, Canadian and Mongolian companies are welcome. Over 180 Mongolian mining executives are expected at MINExpo.To register for the Forum and receive further details, please send an email before September 17 to Ms. Zhen Gong Cross, Head of Mongolian Affairs, US Commerce Department, zhen.gong-cross@trade.gov with your name, title, company/organization, telephone number and direct email address. If you have any questions, contact Ms. Gong-Cross by email, telephone (202-482-2910) or Fax 202-482-1576. For full access to the MINExpo show, you may register at http://www.minexpo.com/attendee-information/registration.html. The General Registration fee for the show is $200 but the US.-Mongolia Business Forum on September 24 is free. Ambassador to Mongolia: Who Is Piper Campbell? The landlocked nation of Mongolia, sandwiched between Russia and China, has long been one of the most remote and least developed places in the world. Its progress toward democracy and economic development since the end of the Cold War will likely be familiar to the career diplomat nominated by President Obama on March 5, 2012, to be the next ambassador to Mongolia. Piper Anne Wind Campbell, daughter of Gay Campbell and David N. Campbell, a longtime director of Gibraltar Industries, which manufactures and distributes building materials. She was born circa 1966 in Buffalo, New York, and graduated Nichols School, a Buffalo prep school, in 1984. She later said her participation in a summer exchange program to Japan “definitely set me onto this career path in diplomacy.” Campbell earned a B.S. in Foreign Service with a certificate in Asian Studies at the Georgetown University School of Foreign Service in 1988, and a Masters in Public Administration at the Harvard University Kennedy School of Government in 1999. She worked briefly for an organization promoting trade between Western New York and Canada prior to joining the Foreign Service in 1989. She began her career with service as a consular and administrative officer at the embassy in Manila, Philippines, followed by a stint as a general services officer providing support to the three U.S. missions in Brussels, Belgium (to the EU, to NATO and to Belgium). Campbell served in the State Department Operations Center from 1994 to 1995, and in the International Organizations Bureau from 1995 to 1996. Detailed to the civil affairs section of a UN peacekeeping mission in the Balkans from 1996 to 1998, Campbell helped the US Agency for International Development (USAID) establish an office in Eastern Slavonia, Croatia, in 1998. After taking a one-year leave to earn her M.P.A. in 1999, Campbell covered Asian issues and Security Council reform at the U.S. Mission to the UN in New York from 1999 to 2002, and served as counselor for Humanitarian Affairs at the U.S. Mission to the UN in Geneva, Switzerland, from 2002 to 2006. Campbell then served at the Embassy in Phnom Penh, Cambodia, first as deputy chief of mission, starting September 20, 2006, and then as chargé d’affaires ad interim from August 25, 2008, to January 19, 2009. Back in Washington, Campbell served as chief of staff to Jack Lew, the deputy secretary of state for Management and Resources, until being named consul general at the U.S. Consulate General in Basrah, Iraq, on July 12, 2011. Piper Campbell has donated $3,200 to Democratic candidates and organizations over the years, with $1,500 going to the 2004 presidential campaign of John Kerry and $700 to the Democratic National Committee in 2004; she also donated $1,000 to Barack Obama’s campaign in 2008, according to OpenSecrets.org. An avid runner, Campbell has competed in marathons and half marathons on three continents. Mongol American is inviting you to visit Facebook Page to build a closer relationship with your Mongol American Friends and their organizations. Support Local Mongol American Business or find nearest Mongol Events Activity to join. Mongol American Presenting Facebook Groups. Are you eager to looking for Mongol Americans on Facebook Groups ? We are recommending to you recent and most active Facebook Groups . Diluwa Khutugtu Jamsrangjab (1883–1964) was supposedly the last Mongolian Khutugtu, a Lamaist dignitary believed to be an incarnation of Buddha, politician and Mongolian-American scholar. Jamsrangjab was a Khalkha Mongolian and considered the living Buddha among the Mongols. He had strong friendly ties with Dalai Lama and Chiang Kai-shek. Dalai Lama, Tenzin Gyatso, respected Diluwa Khutugtu Jamsrangjab as his mentor and teacher during his visit to the monastery he founded in New Jersey, USA. When Jamsrangjab was born to commoners, Bashlu and Gimbeles, in Zagdsambar of Zasagt Khan (in modern Zavkhan Province), there spread mysterious but amazing tales about his born. 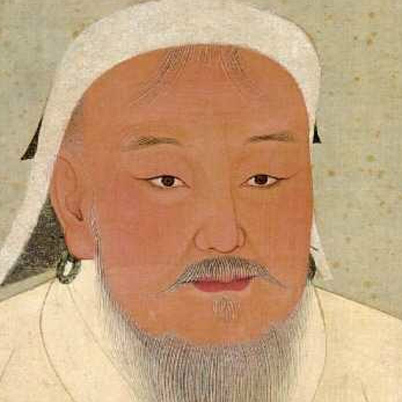 At his age of 5, Bogd Khan declared Jamsrangjab to be the after-life of the late Diluwa. Jamsrangjab with his parents moved to the capital city Nyislel Khuryee. He studied the philosophy of Buddhism so hard that he was awarded religious dignities at the age of 7 and 21. In 1916 the Diluwa Khutugtu was sent to the south-eastern frontier of Bogd Khaanate Mongolia with the Mongolian general, Khatanbaatar Magsarjav to ease the conflict between the Mongols and the Republic of China. Sometime around C. 1919, he attempted to visit Russia to ask help against the growing influence of China, but he was stopped at the borderline due to incomplete identity documents. Diluwa Khutugtu Jamsrangjab was also seeking to ask assistance from the United States of America to support the independence of Mongolia. Diluwa Khutugtu Jamsrangjab was arrested in 1930 due to the accusation that he was linked with the so-called anti-communist leader, Eregdendagva. He was freed later after he didn’t accept the trial. On 26 February 1931, the Diluwa Khutugtu was sent to China by the government of Mongolian People’s Republic to spy on Banchin Bogd of Inner Mongolia, the Kuomintang, and Japanese spies operating in Inner Mongolia. After he had gone, false rumours about him spread among people. At the time, he didn’t know he would never come back to his homeland again. While he stayed in Tibet for 3 years, Diluwa Khutugtu Jamsrangjab was a tutor for the 14th Dalai Lama Tenzin Gyatso. On 28 June 1932, he met Banchin Bogd and attended the conference about the Khalkha Mongolia in Nanjing. While residing in Inner Mongolia, Diluwa Khutugtu Jamsrangjab established contacts with prince Demchugdongrub of the western Sunid (a Mongol tribe) and his fellow Japanese. The political and military leader of China, Chiang Kai-shek, admired his skills after the two had made good friends in a companion. His safety was in danger in Mongolia when his Mongolian colleagues were purged and executed in outer Mongolia in 1937-39. He fled Mongolia when the leftists attacked on the Buddhist Clergy in 1930s.Since everybody who knew his real mission in China all disappeared or executed, the Diluwa Khutugtu was called falsely political refugee and anti-communist. After he came to the USA in 1949 with the assistance of Owen Lattimore and fellow professors, Jamsranjab worked at the Johns Hopkins University. There he joined American-British professor Owen Lattimore‘s the Mongolia Project.In New Jersey, he founded a Monastery with Kalmyk American lamas in 1950-1952. He was elected the chief lama of the Monastery there. 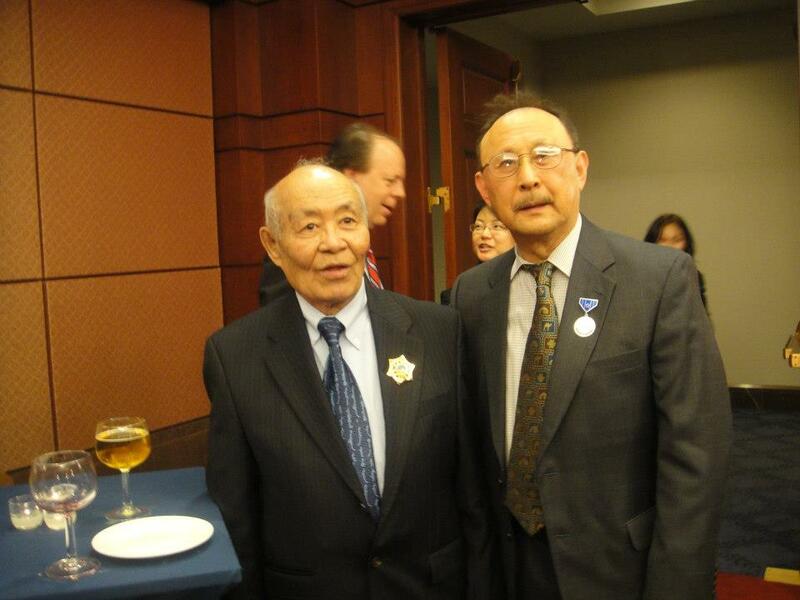 When he was in the USA, he still worked for the international recognition of Mongolian independence. He influenced Chan Kai Shek to declare “Mongolia can be a member of the United Nations like other independent nations” in 1960.On 7 April 1965, the last Mongolian Khutugtu, Jamsrangjab, died at the age of 82 in New York. In 1990, the supreme court of Mongolia proved his innocence and abolished all decrees that accused him of false political crimes. New york City Area Mongolian, Buryat, Kalmyk , Hazara , Southern Mongolians, RPCV-Mongolia , American friends then others . Asheboro ,NC хотын “Deepriver” гэдэг газарт Хойд Каролинагийн өнцөг булангаас цугларан наадлаа. Эхний өдөр асар майханаа барилцан, нутгынхаа дуу хуур тавьсан шигээ, задгай цагаан, хүмүүн төрөлхтөн гэсэн олон сайхан уламжлал болсон нийтийн бүжгүүдийг эргэлдэн эргэн санан дурслаа. 15 – ны өглөө бид шаргуу наадмын хуушуур хийх ажилдаа бүх нийтээрээ ханцуу шамлан орж, олон хүний сэтгэл хүч, хөдөлмөр хөлс шингэсэн, халуун нар, тосонд шарсан алдартай хуушуураа хийж, наадмын үйл ажилгаагаа Монголын далбаагаа мандуулан, наадмын үзэсгэлэн гарган, Төрийн Дуулал дуулан, Монгол ёслолгоо ёслон эхлээ. Монголчууд бид бахархах эх орон, баяр наадам, өвөрмөгц соёл урлаг, ахуй амьдралтайгаас гадна эрхэмлэн хүндэтгэх ёс заншилтай билээ. Ингээд бид Монголын үндэсний наадмын онцлогыг харуулсан асуулт хариултын хэлэлцэл явуулж, мэдэхгүйд мэдлэг, мэддэгт илүүдэхгүй гэгчээр бяцхан ч гэсэн “Наадмын танин мэдэхүй тольтой” танилцлаа. As my posting in Mongolia draws to a close, I want to publicly thank Mongolians living across the country – from Dornod to Bayan Ulgii – for their interest, hospitality and support. I will remember many things about Mongolia. But, perhaps more than anything, I will remember the vastness of the steppe; the beauty of the mountains; the brilliance of the night stars; and the personal kindnesses extended by so many Mongolians at every step of the way. A sense for the fascinating history and unique culture of this great country will also linger, long after my formal assignment in Mongolia concludes. In fact, it has been my privilege to live and work in Mongolia twice – first as USAID country director (2001-2004) and now as Ambassador (2009-2012). On each occasion, I was able to visit all 21 of Mongolia’s provinces. My wife Fiona shares my deep appreciation for Mongolia and our three children Iain, Cameron and Catriona have spent much of their early childhoods in this country, carrying with them memories that will last a lifetime. As a family, we have slept in gers and camped beside lakes and rivers in every corner of this spacious and beautiful land. We have also learned from the many Mongolians we have met, at times sharing in their customs, celebrations and rich traditions. Earlier this month, we had the unforgettable opportunity to welcome Secretary of State Clinton to Mongolia, a historic visit in which she met with President Elbegdorj, Prime Minister Batbold and Foreign Minister Zandanshatar and also addressed the Executive Meeting of the Community of Democracies as well as the International Women’s Leadership Forum. — In 2009, the US Embassy sponsored three Fulbright scholarships for higher education in the United States; for 2011, the figure reached sixteen, including ten scholars funded by the Government of Mongolia. At this point, at least 1,200 and perhaps as many as 2,500 Mongolians are studying in the United States. — Recently, the first Mongolian was admitted to the prestigious United States Military Academy at West Point. Over the past few years, many more Mongolians have received private scholarships to attend leading American universities including Harvard, Stanford and Yale. — In 2009, US exports to Mongolia barely reached $40 million; for 2011, the figure surpassed $313 million. Over the past three years, General Electric opened an office in Ulaanbaatar; Bloomberg Television established a presence in Mongolia; Wagner-Asia launched branch offices in Darkhan and Khan Bogd; and Mongolia signaled its intent to move its national airline MIAT toward an all-Boeing fleet. Major American companies such as Peabody are now poised to make a highly positive mark, joining with Mongolian partners to bring high safety standards, the latest technology and a long-term commitment to developing Mongolia’s mineral sector in a way that is ethical and reflects concern for the environment. — In April 2010, our Embassy received the first ever “Green Embassy of the Year Award” from the US Department of State, in recognition of our attention to environmental concerns. — In June 2010, Mongolia was one of the first four countries world-wide to receive a large grant under the Ambassador’s Fund for Cultural Preservation, sponsored by the US Department of State — $585,000 to help preserve and protect Amarbayasgalant Monastery, located in a beautiful valley in Selenge aimag, five hours north of Ulaanbaatar. — In June 2010, the Los Angeles based band Ozomatli visited Mongolia, attracting some 20,000 Mongolians to hear their music in Sukhbaatar Square. To this day, the Ozomatli concert remains the single largest cultural event that the United States Embassy has ever sponsored in Mongolia. — In November 2010, we welcomed into our home a group of disabled Mongolians representing the Mongolian NGO Wind Bird, returning from a memorable trip to discuss disability issues in the United States. Throughout my tenure, Fiona and I have sought to ensure the involvement of disabled Mongolians across the full range of Embassy-sponsored programs in Mongolia. — In March 2011, it was my privilege to travel to Kabul to spend several days with the Mongolian soldiers serving there. The emergence of Mongolia as a “peacekeeping nation” is a remarkable development, most recently resulting in the deployment of the first of what will eventually be 850 Mongolian soldiers serving in the world’s newest nation, South Sudan. — In April 2011, the Embassy launched a $25 million renovation project, symbolizing our continued and enduring commitment to partnering with Mongolia in a wide range of areas. — In June 2011, President Elbegdorj met with President Obama in the Oval Office of the White House in Washington, DC. During this same visit, he also opened Mongolia’s first Consulate in San Francisco. — In August 2011, Vice President Biden visited Mongolia – the first such visit by a sitting American Vice President in 67 years. This visit also inaugurated our Embassy use of Facebook and Twitter. — In January 2012, the Mongolian National Archives presented to me – which I in turn presented to our Library of Congress in Washington, DC – a facsimile copy of the travel pass given in 1862 to a “Mr. Felosi,” marking the 150th anniversary of what was very possibly the first American citizen to ever visit Mongolia. — In June 2012, the Millennium Challenge Account (MCA) in Mongolia received the MCC’s first ever “Country Commitment Award”, given in part to recognize the special attention that MCA has paid to gender concerns. Over the past year, Americans and Mongolians have together celebrated several notable anniversaries, including the 20th anniversary of Peace Corps in Mongolia; the 20th anniversary of USAID in Mongolia; and the 25th anniversary of the establishment of diplomatic relations between our two countries. In celebrating that 25th anniversary of diplomatic ties, I am often reminded of a statement made many decades ago by an American diplomat named A.W. Ferrin. Serving as a commercial officer in Peking, he argued in as early as 1918 that the United States should establish a diplomatic presence in Urga, as Ulaanbaatar was then known. According to his message back to Washington, if the US were to open such an office, it would become “a most helpful factor in the development of a wonderful country”. Thank you once again for the many kindnesses that we have received over these last three years. As a family, we wish the people and country of Mongolia every success in the years ahead. We also sincerely hope that relations between the United States and Mongolia will continue to prosper. Next time you stop by Round Table Pizza at the Retail Stadium Center near the Big League Dreams in Manteca, chances are you’ll get to meet Odbayar Batbold and Dashdamba Bazardari. They are the two visitors from Mongolia who are being trained at the Manteca restaurant to serve as managers at the first Round Table Pizza restaurants that are being opened in that country. The entrance of “The Last Honest Pizza” into Mongolia also is “a first for any major restaurant franchisor,” according to the company headquartered in the San Francisco Bay Area. The first Round Table restaurant in the country’s capital of Ulan Bator will open in September. Batbold and Bazardari, who arrived on July 3, will be joined by a third trainee in about four weeks. At the Manteca restaurant, the managers-in-training are being taught how to open a Round Table Pizza and are being trained in every aspect of its operation, including making Round Table’s “incomparable pizza dough and sauce,” said Elaine Stevenson, the training manager at the Retail Stadium which is one of the company’s training restaurants. “They are learning how to roll dough, how to make sauce, and how to make pizza,” said Stevenson. They will also take management classes, she said. The opening of the first Round Table restaurants in Mongolia brings the total number of international Round Table Pizza restaurants operating or slated for development to 47, the company also announced. “We continue to see increased interest from abroad as entrepreneurs recognize the value in the Round Table Pizza brand,” noted Round Table Pizza CEO and President Rob McCourt in the same media release. “It is exciting to be involved in bringing the best pizza in the world to countries like Mongolia that have no idea what great pizza tastes like,” said Stevenson. She encourages customers visiting the restaurant to say hello to the two managers-in-training. Bazardari, whom the staff simply refers to as “Dash,” is describe as “more of a visual learner,” while Batbold who is also called simply as “Od” with the letters pronounced separately, is the gregarious one. He is also the more articulate between the two in the English language, and is often tapped to do the translating for his fellow trainee. The 24-year-old Od, who speaks English fluently and with hardly an accent, explained he was mostly self-taught. “I used to watch a lot of (American) cartoons back home,” he said with a big smile, his eyes twinkling. He watched so many of them he does not have any special favorites that he can remember, he added. The Round Table Pizza at Stadium Retail Center is the only Round Table Pizza that is a training restaurant in Manteca. The restaurant also trains managers for the company’s restaurants in the Bay Area. Manteca has two Round Table restaurants – the other one, which is not a training restaurant, is located at Spreckels Park – with one in Ripon n Wilma Avenue, two in Modesto at Orangeburg and McHenry, and one in Ceres. The company was founded in 1959 by Bill Larson whose vision was “to create a place where families could relax and share a superb pizza.” Today, there are 450 restaurants across the western United States and the world. Raising of the Mongolian Flag at the City Hall of San Francisco on Mongolia and San Francisco friendship and Mongolian Heritage Day July 11, 2012. 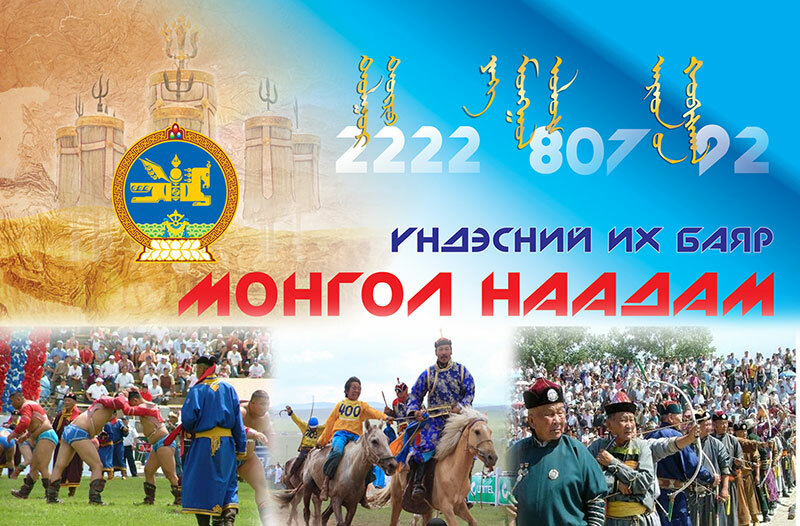 Mongolian National Naadam Holiday Event. Please bring your own tent , chair, blanket, sun protected oil, . The Florida Mongolian Community has been celebrated Mongolian National Holiday, Naadam Picnic at Sand Key Beach on Saturday July 7th. Local Mongolian artist performed Traditional Mongolian instrument Morin Khuur (Horse Headed Fiddle ). Mongolian flag was raised during the event. The Bay Area Mongolian Community Association has been celebrated the 15th Annual Mongolian National Holiday, Naadam festival at Golden Gate Park on Saturday July 7th. The Festival begins with an elaborate introduction ceremony featuring dancers, athletes, horse riders, and musicians. After the ceremony, competition takes place in wrestling, horse racing and archery. During the Naadam MSNOA’s Nomadic Art Gallery (Ger Gallery ) featuring artists Alungoo Sergelen, Munkh-Orgil Battsogt, Namuun Enkhbat, Shijir Jargaksaikhan and Suvd-Erdene Amgalanbaatar. The brave young people who gathered on the streets in those cold December days in 1989, including a young man who would one day be elected as your new President, helped pave the way for Mongolia to become a dynamic and durable democracy. All over the world that year, we saw a flowering of freedom. People stood up and walls came down, said Clinton. Six Wyoming youth will be among 28 from 10 western states experiencing the deserts, tundra forests, snowcapped mountains and ancient nomadic cultural heritage of Mongolia through a youth exchange program administered by the University of Wyoming Extension. The youth, accompanied by four adults, will leave June 30 and return July 19 and spend time in Ulaanbaatar, the capital city, and various rural locations. The visit is through the American Youth Leadership Program funded by the United States Department of State Bureau of Educational and Cultural Affairs. Kim Reaman, volunteer development specialist with UW Extension, will also accompany the group. This is the second year youth visited Mongolia through the program. They are selected through an application and interview process from the 13-state western region of the land-grant universities Cooperative Extension System. Finalists are from Arizona, California, Colorado, Idaho, Montana, New Mexico, Oregon, Utah, Washington and Wyoming. Please join us on Friday July 13th for The Mongolia Society’s Naadam Celebration. Hot dogs and plates, napkins, silverware, etc. will be provided by The Mongolia Society.